After the successful music I wrote for theater company WARNS last year I was again invited to write incidental music for their performances of Edward Albee's play The Lady from Dubuque [De dame uit de provincie] this year. 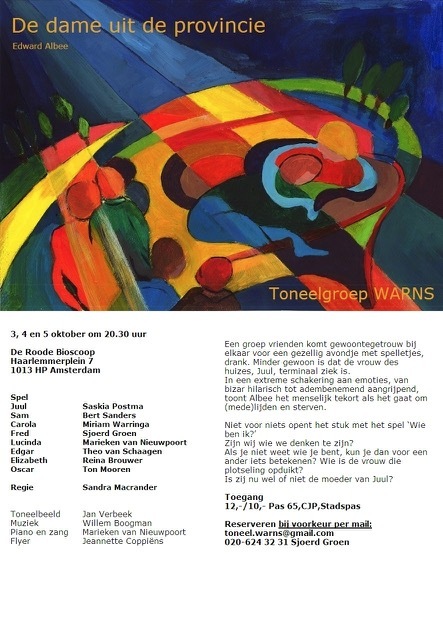 This time I composed a ballad to be sung by the actress Marieken van Nieuwpoort as an intermezzo between the acts, as well as introductory music to the play itself. The scoring is for jazz ensemble (alto sax, muted trumpet, electric guitar, piano, electric organ, bass and drums), which fits the mood of the play. The ballad (›No Time to be Afraid‹) is for voice and piano.